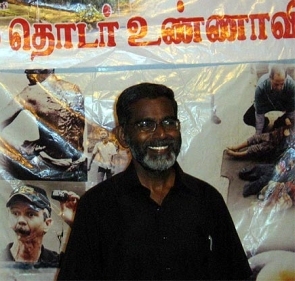 Anti-nuclear power activist S P Udayakumar will be the Aam Aadmi Party candidate from Kanyakumari. The AAP released its seventh list of 26 candidates for the forthcoming Lok Sabha elections on Tuesday. The party today declared candidates for 10 states and one union territory -- Bihar (6), Tamil Nadu (8), Uttar Pradesh (4) and one each for Maharashtra, Sikkim, Tripura, Manipur, Mizoram, Punjab, Rajasthan and the Union Territory of Puducherry. With this list, the total number of candidates declared by the AAP so far has gone up to 268. Kumar, who joined the AAP in February, is the convener of the People's Movement Against Nuclear Energy which spearheaded the campaign against the Kudankulam power plant. The party has fielded Rengarajan V to take on Union minister V Narayanasamy in Puducherry.